Seven or eight years ago, I spent nearly a year building an all-singing, all-dancing replacement for my original active crossover for my semi-active speaker project. The original was a simple 4th-order 500Hz Sallen & Key circuit with compensation for the baffle step, and my new speakers sounded very good with it. The new one was a four-way crossover with a balanced input, balanced outputs, input and output buffering, level and polarity control for three of the four outputs, and push-button control of which filters were in circuit. The baffle step compensation had a selection of seven step frequencies and seven step heights from 0dB to 6dB, so was ready for almost any speaker configuration I could throw at it. The trouble was, when I finally got round to finishing it and replacing the old crossover, I found the sound a little disappointing, with a slight veiling of the high frequencies and a loss of air and dimensionality to the soundstage compared with the original minimalist circuit. Some might put the blame on the handful of OPA2604 op-amps in the circuit, though I personally suspect that the plethora of relays and cheap switches and the complicated grounding system of the crossover (I never managed to get rid of an audible hum through the system) were just as much the culprits. On top of that, transients in the mains supply (particularly when I switched the preamp on!) occasionally caused the settings of the crossover to change arbitrarily. Despite this, I got used to the way my system sounded and still got an enjoyably musical sound out of it, and I put up with the new crossover's shortcomings for several years. Finishing building my Realtime Preamplifier and then comparing it with an Audio Research SP-11, however, finally pushed home the message that the rest of my system really wasn't doing full justice to my terrific new preamplifier, never mind my recently upgraded Pink Triangle Anniversary Vector record deck. Although it was clear that the RTP3 was superior to the ARC, I finally came to the conclusion then that the active crossover was the bottleneck in the system, and that I needed to improve on what I had. Since I have no plans to replace my three-way semi-active speakers, most of the extra facilities of my crossover are redundant right now; for instance, for the foreseeable future I have no intention of building subwoofers, and I can't imagine needing the polarity switching (if necessary I can simply reverse the speaker connections, after all!). I only need a single crossover at 500-600Hz for my speakers, so all that extra circuitry is just burning up the watts for no benefit. I therefore wanted a a crossover circuit that was simple in conception, without any unnecessary features, but which would match up in quality with the rest of my system. Using a fourth-order slope requires at least three cascaded buffer sections, so the buffer circuits have to be as transparent as possible, and low distortion and low noise are important considerations. These days I am very much leaning towards the use of valves, and I prefer high bandwidth circuits with zero negative feedback. My RTP3 preamp is differential and has balanced outputs, which inspired me to start thinking about a differential active crossover to go with it, and I had already put some thought into working out how a differential crossover could be built with valves and no loop negative feedback. Here is a discussion on DIYAudio on active crossovers, with some interesting input from Lynn Olsen, Tom Danley and Joe Rasmussen: the consensus seems to be that cascoding and voltage bootstrapping as in the RTP3 is good, though Joe's opinion is that a bipolar active stage sounds better than Pedja's JFET/MOSFET arrangement. My new active crossover is based on Allen Wright's differential circuit philosophy, and without the redundant frills which I am convinced were restricting the transparency of my solid-state crossover. The low-pass and high-pass legs of the crossover are completely separate, except for the input connection and power supplies, so the differential input circuit is duplicated. I could have shared the input circuit between the two filters, and thereby saved myself the cost of four valves, but this would have made implementing the level control on the low-pass filter more complicated. The input circuit is identical to the one I used in my RTP3, and takes a differential or single-ended input and presents hot and cold outputs with opposite polarities and an output impedance which is close to the value of the anode resistor of 25 K. The gain of the circuit is set by the resistor Ra. The input circuits of both legs are followed by a network to compensate for the low-frequency baffle step loss, as described in the previous article. I found with my previous crossover that 3dB was a good practical size for the step, and that a decibel each way didn't make much difference once it was compensated for by the bass level control, so I settled for a 3dB step centred at 450Hz as before. The high-frequency loss of the network is a factor of three (about 10dB), so the gain of the input stage is adjusted for 10dB for the high-pass channel and 16dB for the low-pass one, to allow a range of adjustment of +-6dB for the low-pass level. I have started off with a 50K Sfernice P11 pot on each of the low-pass inputs to allow me to adjust the relative level, and then once I am happy with this I will connect both inputs directly to the input sockets, replace the level control pot with a fixed input load resistor, and set the low-pass gain for good with the PGS resistor. I had decided already that I wanted fourth-order (24dB per octave) filters, as in the other crossovers I have used with these speakers - my little 10cm HDA midrange unit needs a fast rolloff at its lower end. To do this with unity gain buffers three buffers are needed: one at the input, and two configured as second-order Butterworth filters. I did think about reducing the number of stages by using a combination of an all-in-one third order filter and a first order circuit after the output stage, but the Sallen & Key arrangement shown here has the advantage of unity gain operation. I wanted to use some version of the Super Linear Cathode Follower as the buffers, but if I were to use the full all-valve SLCF from the RTP3 throughout I would end up with forty-four 6922 valves in all - far too many for a single box. I also wanted to use the HPHV shunt regulator, which has a 100mA limit on its output. I therefore had to make compromises. 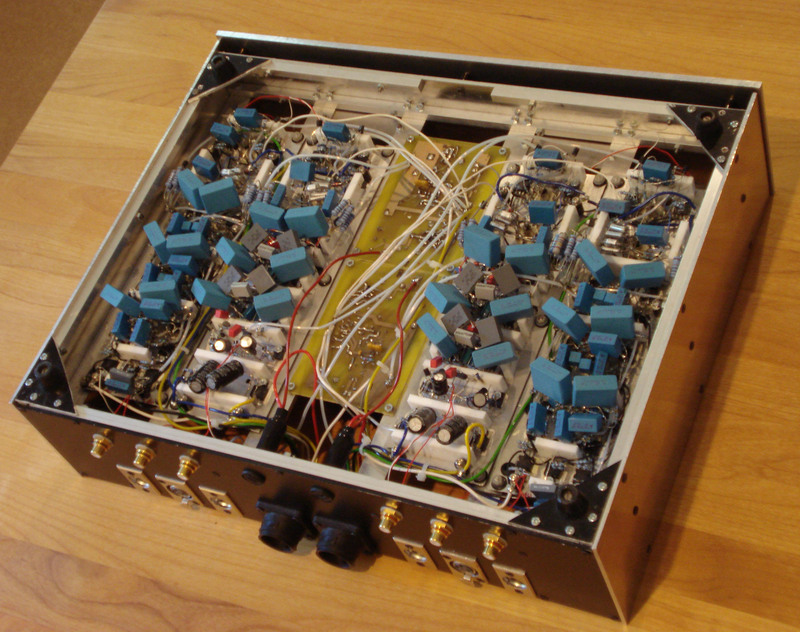 The high-pass filter itself (see above right) is built around the SLCF buffer from Allen Wright's RTP5 preamplifier. This variant of the all-valve RTP3 retains the valve for the cathode follower, but uses IRF710 MOSFETs as the bootstrap device instead of the valve, and replaces the valve in the current sink with another MOSFET. This brings the total valve count for the high-pass filters, including the input buffers, to five per channel, which is bearable. The filter circuit is single-ended, rather than fully differential; I started off with a virtual ground between the 40K2 shunt resistors, connected to the 150V bias point via a 1 megohm resistor, but this resulted in a resonance at 80Hz which is likely to be related to a differential balance which is less than perfect (in other words, the virtual earth isn't). Connecting the 40K2 resistors directly to the bias point, thereby disabling the differential operation of the filters, removed the resonance altogether. The current sinks, with 1K resistors between source and ground, each pass about 9mA, so that the high-pass circuit passes about 65mA in total per channel, which with the 12mA through the input stage of the low-pass filter gives a total current draw of just under 80mA. I could have used the RTP5 SLCF for the low-pass filter too, but I would have ended up with ten valves per channel, which would have made it very hot inside the chassis, as well as uneconomical to leave on for long periods. I decided that I could compromise further for the low-pass circuit, and make the filter circuitry after the differential input all solid-state, though still discrete and retaining the constant-current, constant-voltage cascode architecture and absence of loop negative feedback of the SLCF. The circuit (left) uses buffers based on Pedja Rogic's buffer for his Gainclone amplifier, and is essentially a very similar circuit to the SLCF, but implemented with JFETs and MOSFETs. As with the high-pass filter, this started off as a fully balanced circuit with the shunt capacitors in the filter circuit wired directly between the resistor nodes in the hot and cold halves of the circuit (as in the op-amp version discussed above), but I found that this was unstable. When I divided the shunt capacitors and connected them to ground instead, as in the circuit shown here, the instability disappeared immediately. I altered the current sink circuits slightly to allow a higher voltage rail and to make them less sensitive to device parameters, and they end up looking rather more similar to the ones in the RTP5 than to Pedja's. I also changed the transistor type from the J310 of Pedja's original to BF245C as in the RTP3C, as I had a batch of them and they have a slightly higher voltage specification (30V against 25V), which is likely to improve reliability in this case. The current is about 5mA in each stage, as in Pedja's circuit. A handy consequence of using the 2SK170bl, with its high transconductance and low VP, is that not only is the output impedance of the source follower circuit nice and low (about 40 ohms), but also the gate-source voltage is less than 0.1V at a standing current of 5mA. This is particularly useful here because of the direct coupling between stages of the low-pass circuit: a high DC offset of 1.0-1.5V or more would have meant that each stage would be working at slightly different voltages, making distortion difficult to control. The 5K pots are to adjust the DC offset at the low-pass outputs as close to 0V as possible: it takes around five minutes for the circuit to settle down. The exact offset isn't critical in my system, as my power amps have capacitors at their inputs, but I like to keep it as low as possible. The Zener diodes between the input stage and the first buffer are to clamp the JFET gates to safe voltage values: under normal conditions these will be biased close to zero volts DC, but on power-up and down high transient voltages appear here as the coupling caps charge and discharge. The low-voltage part of the low-pass leg pulls about 35mA from each supply rail, and uses simple transistor-buffered TL431-based shunt regulators, based on the circuit in Werner Ogiers's article in TNT-Audio, fed by constant current sources. The 27 ohm resistors in the LM317/337 current sources set the input current to 45mA, so each regulator shunts about 10mA to ground. The construction of the active crossover was almost identical to the one for my RTP3, including the central mounting for the two voltage regulator boards and the modular construction, which was itself as close as possible to the layout of the commercial RTP3 kit. In the RTP3 the phono and line stages are built on separate 1mm aluminium plates, while in the crossover I built the high-pass and low-pass modules each on their own plate: there are five valves in each HP module, and two in each LP module, so the layout is superficially rather similar to that in the RTP3 (though - as is obvious from the photos - rather more crowded!). The enclosure itself was made from 3mm aluminium sheet, with a 5mm face plate, just like the RTP3. To start with I left the chassis unpainted except for the rear panel, which I sprayed satin black. The circuit is entirely wired point to point, apart from the HPHV regulator PCB: I used 0.9mm 99.99% bare silver wire for all the signal ground and HT connections, as I did with the RTP3, with PTFE sleeving where necessary. Other signal connections were again either bare silver wire or PTFE-insulated silver plated sold core copper wire, while I used standard solid-core insulated copper wire for filament supplies. I trimmed the current sources in the input stages to give 150V at the upper anodes, within a couple of volts. This is particularly important in the high-pass circuit, as this uses the anode voltage of the input stage for its bias. I didn't bother with fine adjustment of the standing current in the SLCF stages, as these are AC-coupled and operate at unity gain, so distortion and common mode rejection are less dependent on circuit parameters; it turns out that the buffers all have a quiescent current of 9mA within a couple of percent anyway. I rebuilt the power supply for the preamplifier in a full-width case very similar to that of the preamp and crossover, and built the PSU for the crossover in the same box. With both power supplies in the box, the multitude of transformers and capacitors make it very crowded in there (not to meantion heavy). The PSU is connected to the crossover box via a 14-wire umbilical lead with Amphenol C16 connectors, with a separate lead per channel. There is a mains earth wire in each lead for safety: 350V DC in an un-earthed metal box makes me nervous, but when I built the PSU for the RTP3 to start with I forgot the earth wires so I had to add these connections separately. The whole is sheathed in a dark grey braided sleeve which makes the lead look a little like the one on the ARC SP-11 I had in my system a while back. The crossover uses the same HPHV shunt voltage regulators as in my RTP3. The AD655 precision op-amp that is specified in the HPHV manual, and which I used in the regulator in the preamp, is now pretty much impossible to find (and they were £16 each even when Farnell stocked it), so I substituted the AD9631, which seems to work fine. Emile warns against using any other op-amp but the AD655, on the grounds that the latter has dual power supply pins, but in the AD9631 pins 1,8 and 5 are not connected, so it appears not to be an issue with this chip. The first regulator PCB I built worked first time with no problem. However, a stray bit of copper foil beneath a small electrolytic capacitor shorted the output of the LT1085 regulator on the second board not long after I completed it, and consequently took out almost every one of the semiconductors on the PCB as well as several resistors and one of the preset pots. It took me more than six weeks to find out what had gone wrong and replace all the parts. On top of all that, when I had fixed that regulator and finally managed to get the crossover circuits working properly, I was just about to start measuring the frequency responses, when there was a "pop" and a little wisp of smoke from a MOSFET on the same regulator board, and most of the semiconductors were toast again: an incorrectly installed insulator on one of the IRF710s had failed and the B+ shorted to ground. The heatsinks on the the regulator boards run pretty hot. The power dissipation in the MOSFETs in steady state operation, with the power supply set to supply about 345V and with 10mA of shunt current, is not far below the respective limits of 5W and 10W quoted by Emile (I calculate about 40 degrees C above ambient with the heatsinks I used). I'm not altogether happy with running a circuit which is uncomfortably hot to the touch, but I note that the regulators in the RTP3 itself run hot too (though that has a standing current of about 75% of the crossover), and that has been in regular use for two and a half years now - I suppose that says something about the ruggedness of the IRF MOSFETS! Resistors are all standard Maplin 1% metal films: these are mostly 0.6W, but with 2W resistors in the higher-voltage positions. The 25K anode resistors in the input stages were made up of four 100K 2W metal film resistors in parallel. I used Mundorf KP-SN 630V polypropylene film and tinfoil coupling caps, and Vishay KP1830 polypropylene and foil 250V 10nF 1% caps in the high-pass filter circuits. The capacitors in the baffle step circuits are paralleled 160V 1% polystyrenes: 22nF, 10nF and 4.7nF and 2.2nF to give 39nF . The rest of the capacitors (mainly decoupling) are EPCOS MKP metallised polypropylene. As in my RTP3, the valves were all Electro Harmonix 6922, with the ones in the input stages selected by BTB for low noise and microphony. The valve sockes are standard ceramic types. I measured the transfer functions of the crossovers with and without the baffle step compensation in place. The measured responses shown here (with no diffraction compensation) are within about half a decibel of the target curves. This measurement was mainly to confirm that the circuits were working properly: I suspect that the performance is rather better than this, as I used 1% tolerance parts everywhere and my frequency response instrumentation (an old battery-powered sinewave generator and a couple of digital multimeters) isn't really appropriate for serious audio measurements. The noise at of both high-pass and low-pass outputs was less than the lower cutoff of the AC range of my multimeters, 1mV. All in all, I was happy with the measurements I made. When I was first evaluating my RTP3 preamp, as well as when I was enjoying comparing it with an Audio Research SP-11, I had at the front of my mind the thought that the active crossover was probably holding up the performance of the system so, even though in the end the differences between the preamps were still easy to hear, I was still curious about what I might be missing. Unfortunately, when I had finished the current project a couple of years on, this situation appeared to be repeating itself. The 6080 regulator valve in one of my nearly twenty-year-old Croft Series 5 power amplifiers went to its grave a few weeks before with an audible pop and some sparks. I suspect that the other valves are also not in their first flower of youth any more, as there is a slight fuzziness to the sound of the remaining Series 5, which I thought was unlikely to be due to the solid-state crossover circuits. When I finally, and with great trepidation, connected the new crossover into my system and switched it on for the first time, it nevertheless immediately sounded rather different from the old one, even though there was no obvious change in tonal balance. Right from the start, even when the crossover was still cool, the sound swelled out into the room, filling the space above and around the speakers, where with the solid-state crossover the soundstage had seemed a little compressed onto the line between the speakers. The music also sounded less dynamically constrained than before: with the old crossover the system often sounded as if it was trying too hard, especially at higher volume levels, where with the new hybrid crossover dynamics were more natural. From my experience hearing various systems over the years, these are the most immediate differences that I would expect to hear moving from a circuit based around op-amps to one with valves as the principal active elements. The new design also sounds (as far as my aural memory extends!) quite unlike the original one I built at the same time as the speakers, which, although not suffering from the "veiling" of the last one, sounded obviously crisp and detailed, whereas the sound now is much more organic, with details appearing naturally without being pushed to the foreground. The crossover is settling in now, and I am starting to get used to the difference in sound. I lowered the bass level, which got rid of some slight excess in richness; the remainder is likely to be a combination of the innately warm character of the Croft amp, the proximity of the speakers to the wall, and the room acoustics. My system has become (perhaps unfortunately) more discriminating of source material: the first music I put on this evening was a couple of new CDs by Jack Penate and Daniel Merriweather that my step-daughter had lent us, and found them uncomfortably brash and forward, and generally very "digital" sounding (even after the system had been on for an hour). This isn't a universal problem with modern pop recordings, though, or even necessarily of the CD medium: we also listened to Brazilika by Gilles Peterson on CD, an eccentric blend of recognisable Brazilian dance music and more avant-garde sound effects, and this came over much more acceptably, with nicely realistic percussion. Brenda said at one point "I'm really getting into this now - it feels as if the singer is in the room in front of me", which must be a sign that I'm getting something right- especially with my antiquated CD player! I then moved back to black disc, and Richard Strauss's Le Bourgeois Gentilhomme, played by the Arts Center Orchestra of Canada under Eduardo Mata. This witty and sophisticated music sounded very natural for a 1984 digital recording, with a convincing sense of scale to the orchestra. The system is continuing to improve, day by day. This evening I started with an old favourite, Joan Armatrading's Show Some Emotion on LP. The music was vibrant and the performers almost tangible. The cymbals on the title track were the most realistic I have heard through my speakers, and the electric bass was also improved - funky, but with no bloat at all. I followed this up with Michael Tippett's Fantasia on a Theme by Corelli, played by the strings of the Academy of St Martin in the Fields, with Neville Marriner conducting. I remember being fascinated by this piece the first time I heard it as a teenager; it starts with an near exact rendition of the first few bars from a Corelli Concerto Grosso, but before long the Baroque harmonies dissolve into an altogether mid-20th Century chromaticism and the music becomes pure Tippett, only to miraculously reassemble itself back into Corelli a minute or two before the end. The mid-seventies recording has a beautiful lush and bloomy string sound, and I still don't hear any trace of the tonal thinness that Brad Morrical noted in his review of the RTP3 preamp. The concertante violins and cello were noticeably, though not unnaturally, in front of the string band, and the two violins were distinctly separate in both position and character. I finished off with Vladimir Ashkenazy's Decca recording of Prokofiev's "Classical" Symphony. By this time it was getting late, and the volume was quite low, but I had for the first time the illusion of a small but perfectly formed orchestra arranged between the speakers. Although the sound was quiet, I could hear all the orchestral sections and the performance was riveting. While I was listening to the Tippett I realised with a surprise that, for the first time in many years, I was starting to relax into the music (and this despite all the stress that went into building it!). For a long while before then, I found myself almost unconsciously tensing physically and mentally in my listening seat, as if I was half expecting something a little unpleasant to happen. Replacing my solid-state preamp and the Audio Synthesis phono stage with the RTP3 helped noticeably, but for a long time I think I have been listening to music rather cerebrally and critically, rather than letting it take me over; the last time I could let go this way was probably when I had an all-Croft system and my ProAc speakers. This confirms several things for me: firstly that the intuitive feeling I had that the crossover was the limiting factor in my system was correct, and secondly that I made the right decisions in the design of the new crossover. This observation also reinforces my conviction that double-blind (ABX) testing of audio equipment says rather little about the experience of listening to music at home for pleasure. Because of the inconvenience of accessing the back of the boxes (and the presence of 300V DC on the exposed underside of the crossover circuitry - I have already had a warning nip from this once! ), I wasn't planning to do any direct comparisons between the old and new crossovers. However, as a result of a fault that developed in one of the the low-pass filters, the new one was relegated to the workbench again for a few days, so I put the old crossover back into the system while I was sorting out the problem, and this turned out to be interesting. As I mentioned in my last update, there was a significant, if almost subliminal, improvement with the feedback-free SLCF crossover which affected my state of mind while listening to music, much more than any conscious change in perception of musical details did. However, with the op-amp based circuits back in the system I became more aware of what the old crossover was specifically adding to the sound. In objective terms it seemed to be doing all the right things (apart fom the compression of the sound stage that I mentioned earlier), and by most standards sounded pretty good, but I felt my jaw and temples starting to tense as before, and I also noticed for the first time a kind of "sheen" on top of the music. I can't rule out the possibility that this might be due to some RF demodulation (originally I found the crossover picked up Japanese radio, but putting 100pF polystyrenes between inverting input and output of the op-amps cured this), so I can't make general statements comparing the sounds of solid state and valve circuits Nevertheless, the changes do indeed correspond to my prejudices and expectations about valve circuits being more "listenable" than solid-state ones. In the end the crossover was exiled from my system for several frustrating weeks: I had to replace a pair of 2SK170 JFETs in the left channel low-pass circuit which had blown (probably as a cumulative result of not having the overvoltage protection in place in the early days). I then spent a couple of weeks chasing up a persistent hum in that channel which mysteriously went away by itself - I suspect there may be a dodgy connection somewhere, but until it becomes a problem again I will leave it alone. I started off with Paul Simon's Rhythm of the Saints on vinyl in the background. In some ways this isn't exactly a demonstration quality disc, as it has some of the constricted feeling I get from 1980s recordings (I'm not sure whether it was digitally recorded, but it sounds like it). All the same, I am very fond of some of the songs, particularly Further to Fly and She Moves On. With the new crossover I really had the impression of a whole forest of percussion in some of the tracks, and the dynamics often had that "surprise" quality, even at a low volume. Staying with the Brazilian theme, I then listened to a 1970s (definitely analogue!) recording of Villa Lobos's Bachianas Brasileiras, played by the Orchestre de Paris under Paul Capolongo. This LP has a wide variety of textures, including the full orchestra in No. 2, string orchestra in the moving No. 9 (Prelude and Fugue), and the strangely intense scoring of No. 6 for solo flute and bassoon, and the sound is very rich, natural and involving. Finally, I moved from Brasileira to 100% Bach and the Art of Fugue, played by the Leipzig Bach Collegium on Capriccio. Although this is a digital recording, the tonal contrasts between the modern instruments are very vivid, and the clarity of my system made the counterpoint easy to follow, while at the same time presenting the music as a whole in a relaxed and unfatiguing way. One thing that has surprised me is that the bass generally appears better defined and more natural through the new crossover: orchestral double basses have more texture and are more integrated with the rest of the sonic picture. I have had the crossover back in my system for a fortnight now after my whole system was out of action for three weeks again while I moved the RTP3 power supply into the box containing the PSU for the crossover. There is still a hum from the power supply that is only just about audible from my listening seat in quiet moments, but it is no longer intrusive, which it was when I had the two separate boxes full of transformers, one on the top shelf and with no lid on. I finally feel that the system is sounding as good as it can without replacing any of the components. I further reduced the bass gain on the crossover, which brought out more texture and detail, and then used a multimeter to make sure that the gain of the low-pass circuits of the two channels were identical to within a per cent or so, which brought a surprising improvement in focus. After my observations back in August about being able to relax into the music with the new crossover, I relapsed for quite a while back into critical mode, as I tried to work out what was still missing with the system, but with these final tweaks in place I have just started really enjoying music again. I realised that I had been rather timidly selecting snippets of music that I thought might test the tonality of the system, rather than for pure musical enjoyment, and frankly didn't enjoy a fair amount of it - and mostly not through any fault of the system. Tonight, though, I played the whole of Beethoven's Third Piano Concerto, with Brendel and the LPO under Haitink (an excellently-recorded Philips box set), and was again immersed in the flow of the music. There was a real sensation of the "presence" of the pianist and the orchestra and of natural dynamics and flow. After the Beethoven I tried a DG LP set of Mahler's Third, with Abbado and the VPO, which had been lingering in my "cull" pile for months - this is an early (1982) digital recording, and I had originally found the low recording level and generally dry sound made it hard to listen to at any sensible volume setting. This now sounds much better (though the LPs are crying out for a proper clean), even though it still lacks the "body" of analogue recordings or of more recent digital ones, and I am tempted to keep it from the charity shops for a little longer. I also listened to a very different Mahler recording, this time the Kubelik Seventh with the Bavarian Radio Orchestra from 1970, which I have found uncofortable listening for different reasons: this has always sounded to me a little emphasised at the top, with harsh string sound as well as a rather narrow stereo image. Now the narrow soundstage remains, but the music seems much more focused within it, and I very much enjoyed the romantic second movement and the nightmarish Scherzo, which with its neurotic chromaticism and angular textures seems to me to herald the music of Schoenberg and Berg. In one sense, this project failed: I was unable to get a pure differential filter to work properly in either the low-pass or high-pass circuits. I was forced to reference the shunt legs of the filters to ground, since the virtual ground I proposed in the previous article did not work when presented with slightly unbalanced signals. All the same, the differential input and the subsequent separation of the hot and cold circuits will still provide excellent rejection of noise when the balanced outputs are used, both from external sources and from the power supply. The new crossover seems to be continuing to improve week by week, which I find difficult to understand in terms of any actual changes in electronic parameters of the circuits! There are some relatively obvious, "hi-fi" improvements to the sound which I have noticed: these include more natural (and more clearly differentiated) tonal colours and more effortless dynamics, as well as more focused images of instruments and performers. What has struck me with this project, more than any other, though is the distinction between these explicitly observable changes and the increased capacity for musical satisfaction compared with what went before. I realised I was going through a period of musical frustration before the new box went into the system, where I was choosing recordings to listen to on the basis of the sounds on the record, rather than the musical content. In contrast, I have started returning over the past month or so to my old favourites and once more finding delight in them - the Brendel Beethoven sonata and concerto sets, for example, and Glenn Gould's Well-Tempered Klavier. I think the key is the less fatiguing sound, where musical events can take the attention of the mind without the distracting artefacts of subtle electronic distortions. I don't think I'm quite at my ultimate destination yet, as I don't have the "holographic soundstage" that I have experienced in a small handful of systems, and which my analogue front end and electronics are reputedly capable of. The main obstacle in this is undoubtably the listening room, with its odd shape, resonant floors and lightweight walls, as well as the positioning of the speakers only a few centimetres from the back wall, but for the moment there is little I can do about any of these limitations. However, the Croft power amplifier, with its valves at pensionable age and its traditional ultralinear circuitry with global feedback, is the final link in the chain that I am able to fix without moving house. I am keenly anticipating getting on with building my next project, a differential push-pull 300B amplifier with no loop feedback, which should bring the virtues of the preamp and crossover circuits all through the system. Funnily enough, my main lesson from this project was a promise to myself that I would never tackle anything as complicated as this again! The crossover it replaced was certainly unnecessarily complex, but this one, with its point-to-point wiring and insanely crowded interior, took me over a year and a half to complete, and the struggle to get it working properly was the final straw that persuaded me to go simple in future. I have also been seriously put off complex solid-state regulation circuits, even if their performance might be beyond reproach. Once the regulators were finally functioning correctly, I spent over a month trying to work out why the SLCF circuits weren't working, and this turned out that some of the IRF710 MOSFETs had insulation faults on their gates, probably from static damage (and most likely from Banzai's primitive packaging method: throw a couple of dozen MOSFETs in an ordinary polythene bag with no electrostatic precautions whatsoever!). Because of the high impedances around the bootstrap circuits, this design seems unusually sensitive to the smallest fault in gate insulation; I certainly haven't come across problems as frustrating as this elsewhere. Allen Wright tells me that doesn't recommend the RTP5 circuit these days, as he feels that the nonlinear gate capacitance of the MOSFETs in the bootstrap circuit (though not the ones in the the current sink, it seems) contributes audible distortions, compared with the full valve RTP3 version. He suggests these be replaced with high-voltage bipolar transistors, and I may well try this at some point. On a practical note, if I ever built an SLCF-type circuit again, I would definitely get hold of some lower-voltage 1uF polypropylene caps than the 400V ones I used, as in the positions that they are used in here they only see at most 20V, and - as the photos show clearly - they are physically far too big, making access to the rest of the circuitry very awkward. Cricklewood Electronics who provided the valve sockets and silver wire. 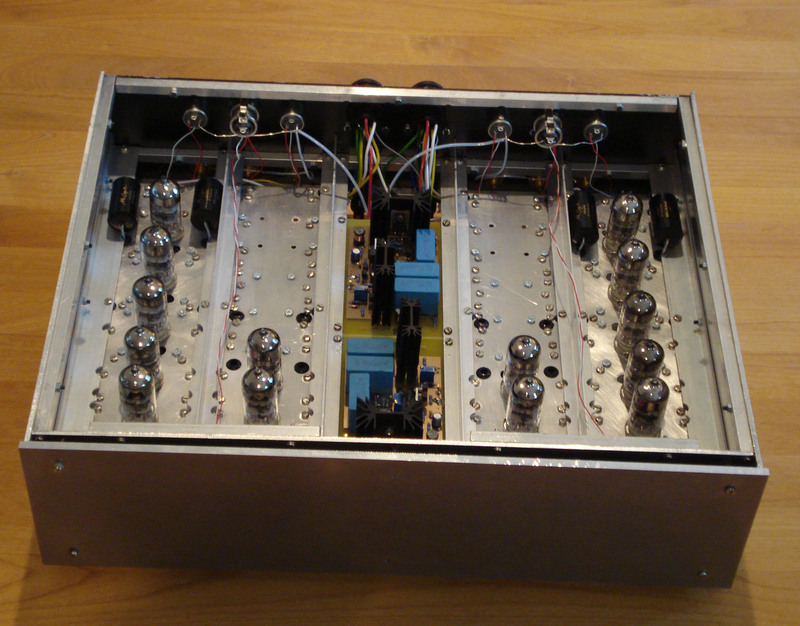 Banzai Musical Effects in Germany, who supplied the MOSFETS and some of the valves for this project. BTB Electronics in Nurnberg, Germany: they have a good range of parts and excellent service, and were recommended to me by Allen Wright. I bought the input valves from here. Variable Voltage Technology Ltd, providing a range of transformers and chokes. I used their VTL103 10H 180mA choke and VTH106200 300V 180mA mains transformer for this project. The Hi-Fi Collective - a good source of parts, although their prices are high for valves. The rest of the parts were from Maplin, RS or Farnell. I am indebted of course to Allen Wright for the original circuit inspiration and his discourses on audio design. I am also obliged to Emile Sprenger for his excellently documented HPHV regulator PCB design, and to Pedja Rogic and Werner Ogiers for making their circuits available for cheapskate amateurs like me to plunder.